여름의 더위가 무르익어가는 8월의 시작에 이노진으로 인사드립니다. 이노비는 7월 한 달 동안 입원 치료 중인 어린이 환자, 요양중인 노인분들, 특수교육을 필요로하는 어린이와 청소년을 찾아가 아웃리치 공연을 가졌습니다. 아웃리치 공연이 이루어질 수 있도록 후원뿐만 아니라 많은 격려의 말씀으로 힘을 더해 주신 분들께 감사의 인사 드립니다. I say hello through the August issue of EnoZine, in the middle of a hot New York summer. 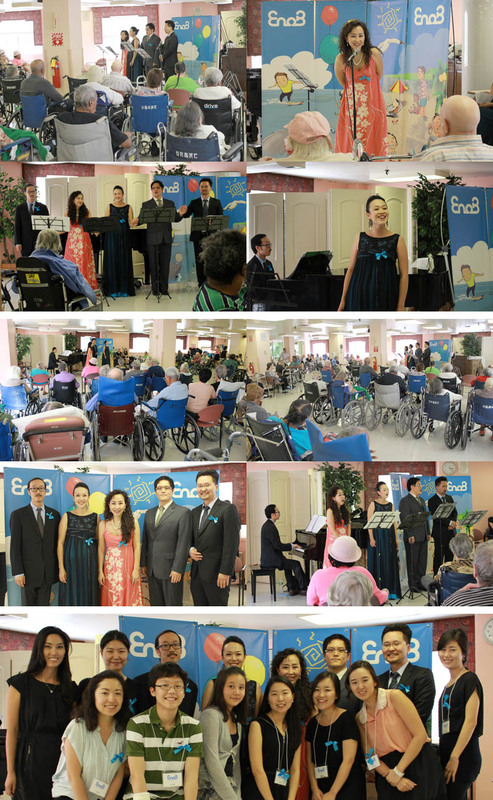 EnoB held 3 outreach concerts last month - for the hospital patients, the elderly who are in nursing center and the children with special needs. We would like to thank all the people who have been supported us and allowed these concerts to take place. 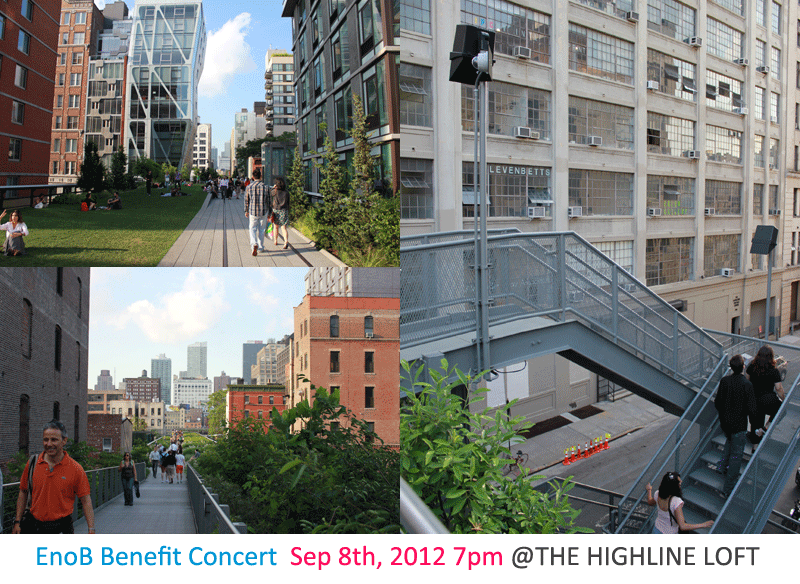 We are currently preparing for our annual benefit concert on September 8th. I invite every "EnoBian" to continue to serve as an "Innovative Bridge" with EnoB. I look forward to seeing you at EnoB's benefit concert! 7월 12일 오후 2시, 콜롬비아 대학병원 어린이병동 1층 로비에서 이노비의 찾아가는 음악회가 열렸습니다. 150여명의 입원 중인 어린이 환자들은 직접, 또는 병실의 화면을 통해 공연을 감상했고, 이노비는 다가오는 10월, 다시 한 번 콜롬비아 대학병원을 찾기로 약속했습니다. 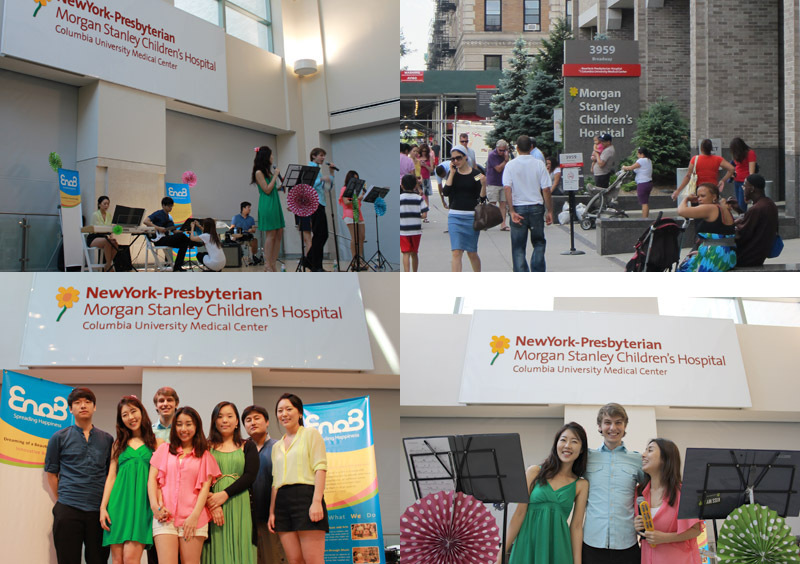 EnoB's outreach concert was held in the first floor lobby of New York-Presbyterian Morgan Stanley Children's Hospital of Columbia University Medical Center at 2pm on July 12, 2012. About 150 pediatric inpatients enjoyed the live performance and through television monitors within the wing. EnoB is scheduled for another visit in October. 7월의 마지막 주 목요일 오후 2시, 이노비는 맨하탄 79가에 위치한 드윗 요양원에 찾아가 삶의 마지막 단계에 접어드신 어르신 분들께 아름다운 공연을 선사해 드리고 왔습니다. 소프라노 최경선 선생님 외 3명의 성악가 분들이 이끄신 이 번 공연은 귀에 익은 오페라 아리아로 그 곳에 계신 어르신들의 마음에 위로가 되어 드렸습니다. 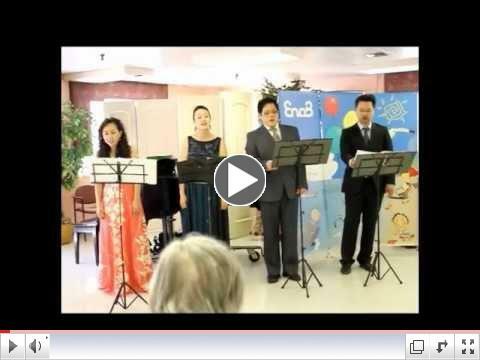 On the last Thursday of July, EnoB provided a beautiful performance to seniors living in DeWitt Rehabilitation and Nursing Center located in Manhattan at 79th Street. Four opera singers, including Soprano Kyungsun Choi, performed familiar operatic tunes by various composers. The concert helped soothe and lessen the isolation and loneliness of the audience members. 앵콜을 두차례나 받은 이노비의 공연을 보시려면 아래 동영상을 클릭하세요! 7월 27일 금요일, 미주 동북부 지역 8개 밀알 선교단이 연합으로 여는 '밀알 사랑의 캠프'에 이노비가 초청되어 공연을 펼쳤습니다. 600여명의 캠프 참가자들과 함께 이노비는 새로운 곡들로 신나는 시간을 가졌습니다. 자세한 소식은 다음호에서 만나보실 수 있습니다. EnoB was invited to give a performance at 'Summer Love Camp' hosted by eight Mil Al Missions of the eastern coast region of the United States. A new program with exciting repertoires was introduced to bring smiles and joy to approximately 600 children with disabilities. EnoB 베네핏 콘서트가 9월 8일(토) 7시에 Chelsea에 있는 Highline loft에서 개최됩니다. KBN 파워인터뷰에 강태욱 대표가 출연해 이노비를 소개했습니다. 행복 나눔을 지속해오고 있는 훈훈한 이노비의 이야기를 들어보세요! President Tae Wook Kang introduced EnoB at KBN Power Interview. Did you watch the TV program? Take a look at how EnoB is spreading happiness through its work. "함께 인생의 스펙 쌓고 있죠"
왼쪽의 사진을 클릭해서 기사를 확인하세요. 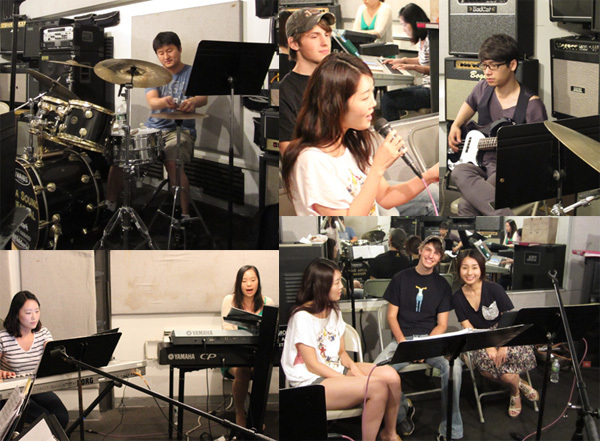 Bomi Kim, program manager of EnoB, and her husband Seungku Lee are volunteering at EnoB through their special talent. 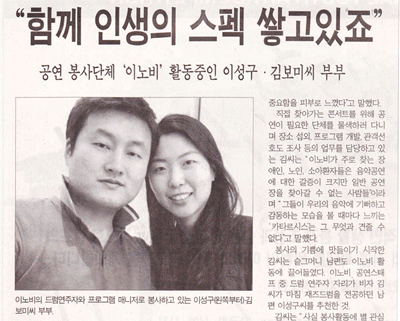 This beautiful couple's story was told by The Korean Times. 아래 날짜를 클릭하시면 이노비 기사를 보실 수 있습니다. 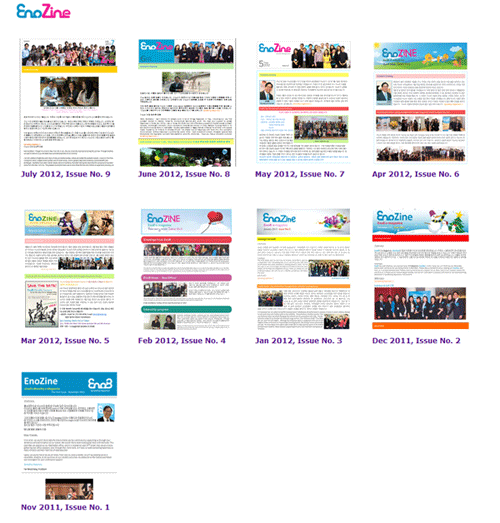 Click the date to see the articles. 뉴저지 초대교회 특수예배부 His Friends(HF)를 소개합니다. His freinds는 2011년 1월 His Friends에는 8명의 특수교육이 필요한 아이들과 고등학생 4명의 봉사자로 시작하여 지금은 총 33명의 아이들과 28명의 고등학생 봉사자가 함께 하고 있습니다. 뿐만 아니라 37명의 교회 성도들도 His Friends에서 봉사하며, 도움이 필요한 학생들의 눈높이에 맞추어 교사가 일대일로 지도하고 있습니다. 아이들의 순수함과 선생님들의 사랑이 어우러진 His Friends에서는 매주 일요일 11시마다 기쁨이 넘친다고 합니다. 기쁨과 사랑이 사라진 세상 속에서 His Friends는 몸이나 마음이 아프거나 조금 다른 아이들을 사랑으로 반겨주고 함께 활동하면서, 사랑으로 세상을 밝게 비추는 것을 비전으로 삼고 있습니다. His Friends의 강대열 전도사님은 "His Friends에서 부르는 찬양 중에 'Absolutely Nothing!' 이라는 것이 있습니다. 이 세상에 어떠한 것도 우리들의 사랑을 빼앗아 갈 수 없다는 내용입니다. 처음엔 말 그대로 'Nothing'으로 시작한 His Friends가 이제는 저와 우리His Friends를 섬기시는 분들의 'Everything'이 되어버렸습니다. 함께 사랑을 나누시는 분들께 감사의 뜻을 전하고 싶습니다" 라고 하십니다. We are glad to introduce His Friend (HF) at New Jersey Chodae Community Church. On January 2011, His Friends started with eight children who needed special education and four high school students who are volunteers. Meanwhile, currently it has enlarged to about 33 children and 28 student volunteers. 37 other members of the church are also donating time and service to tutor those who are in need. In this desolate world, His Friend wishes that true happiness can be spread all over the world beyond New Jersey, New York, and Pennsylvania. His Friend believes that they can brighten the world by sharing their love with others. 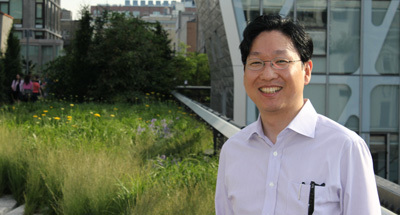 Daeyeol Kang, a preacher, said "There is a chant name of 'Absolutely Nothing!' which means nothing can take away our love from ourselves. Literally, even His Friends had started from 'nothing' now it became to be an 'everything' to members of His friends. I am grateful to those who share their love". 이 노비와 함께 하게 된 이노비 주니어, 소피아를 소개합니다. 독서와 그림 그리기를 즐기는 소피아는 이제 7학년이 되고 맨하탄의 garment district에서 살고 있습니다. 소피아는 이노비의 베네핏 콘서트에 참석하여 이노비의 활약상을 찍은 동영상을 보며 이노비에 대해 관심을 가지게 되었다고 합니다. 주니어 스텝으로 자원봉사를 하는 것은 이번이 처음이라 더욱 설레고 기대가 된다고 하는데요, 앞으로 어떤 활약을 보여줄 지 기대가 됩니다. We would like to introduce Sophia Koock, EnoB junior staff. She is going into the seventh grade at the Center School in September. She lives in the garment district in NYC and likes to read and draw. 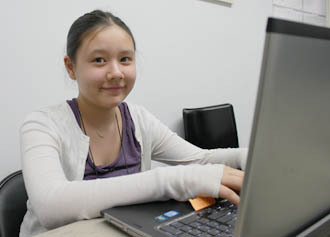 She began to volunteer at EnoB because she went to the benefit concert and saw the video there. She is so excited to be a member of the junior staff at EnoB since this is her first volunteer experience. 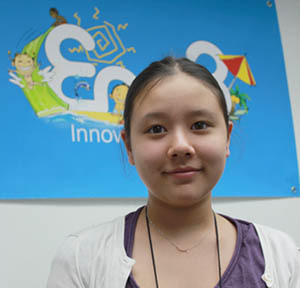 Welcome to EnoB, Sophia! 이노비에 새롭게 합류한 정한나 코디네이터를 소개합니다. 정한나 코디네이터는 숙명여자대학교 영문학부를 졸업하고 한국 HSBC은행에서 근무하다가 결혼 후 미국으로 오게 되었습니다. 예술을 통해 봉사할 수 있는 일이 없을까 찾아보던 중 우연히 이노비를 알게 되어 이노비 풀타임 스탭으로 합류하게 되었습니다. 앞으로 정한나 코디네이터가 이노비에 밝은 에너지와 열정을 불어넣어주길 기대합니다! 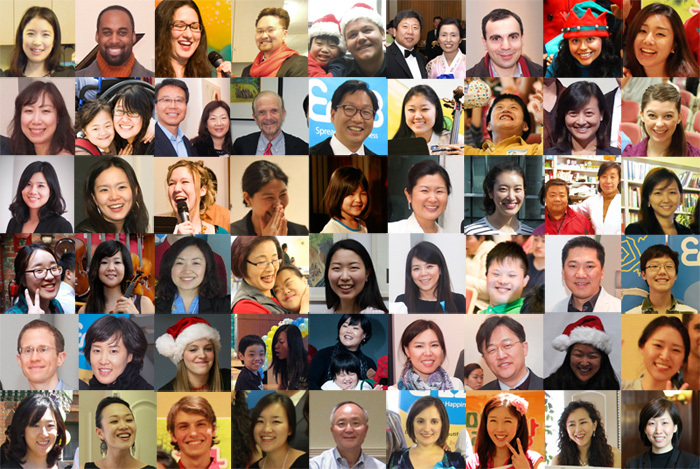 We introduce our new coordinator Hanna Jung. She holds BA in English Literature from Sookmyung Women's University and came to live in New Jersey after marriage. She had been looking for a community where she can serve the underprivileged people through art, especially with music. She came to know of EnoB and join EnoB as a coordinator. We welcome her and know that she will be an energetic and enthusiastic addition to the group. 이번 여름에 약 7주간 함께 하게 된 최강림 인턴은 중앙대학교 인턴 프로그램을 통해서 뉴욕 이노비에 오게 되었습니다. 짧은 시간이지만 뉴욕의 여름을 즐기고, 이노비를 통해 의미 있는 시간을 보낼 수 있기를 응원합니다. 이은별 인턴은 뉴욕대에서 음악치료를 공부하고 있는 대학원생입니다. 이노비에서 은별님의 전공을 살려 다양한 경험을 하는 의미 있는 여름이 되기를 기대합니다. 그 동안 이노비의 인턴으로 함께했던 박은경님은 이번 여름을 끝으로 이노비를 떠나 보스턴에서 학업을 시작합니다. 박은경님이 이노비에서 보여주셨던 책임감 있고 당당한 모습으로 새로운 환경에서도 좋은 열매를 거두기 바랍니다. 이렇게 든든한 인턴들과 함께 한다면 올 여름의 무더위도 끄떡 없을 것 같습니다. 섬머 인턴들 많이 응원해주세요! Let's meet EnoB's summer interns! 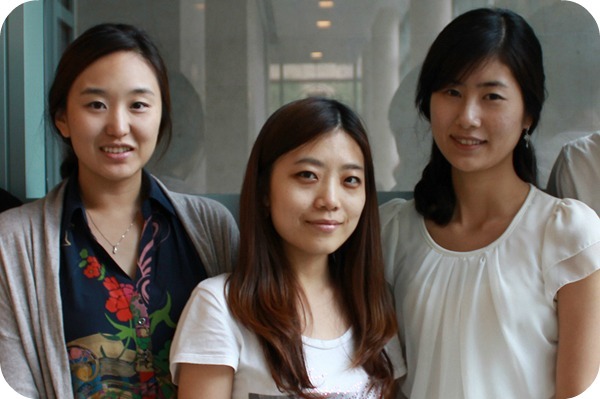 - Ganglim Choi from Chungang University in Korea has joined EnoB through an internship program. 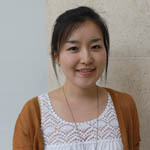 Eunbyul Lee currently studies Music therapy in NYU Steinhardt School of Culture, Education, and Human Development. - Eunkyung Park has been working with EnoB for few months before she leaves New York City to pursue her graduate studies in Boston, MA. We hope she will do a great job in a new environment with confidence as she showed us throughout her internship at EnoB. We are so happy to have these new additions to our EnoB family and hope they will experience many things with EnoB and enjoy the beautiful summer time in NYC!